What is TFT LCD TV and LCD Monitor Panel? Liquid crystal was discovered by the Austrian botanist Fredreich Rheinizer in 1888. "Liquid crystal" is neither solid nor liquid (an example is soapy water). In the mid-1960s, scientists showed that liquid crystals when stimulated by an external electrical charge could change the properties of light passing through the crystals. The early prototypes (late 1960s) were too unstable for mass production. But all of that changed when a British researcher proposed a stable, liquid crystal material (biphenyl). 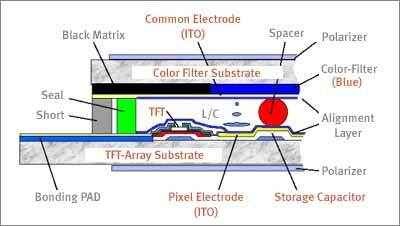 Today's color LCD TVs and LCD Monitors have a sandwich-like structure (see figure below). TFT Glass has as many TFTs as the number of pixels displayed, while a Color Filter Glass has color filter which generates color. 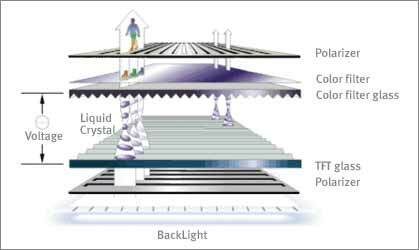 Liquid crystals move according to the difference in voltage between the Color Filter Glass and the TFT Glass. The amount of light supplied by Back Light is determined by the amount of movement of the liquid crystals in such a way as to generate color. The most common liquid-crystal displays (LCDs) in use today rely on picture elements, or pixels, formed by liquid-crystal (LC) cells that change the polarization direction of light passing through them in response to an electrical voltage. As the polarization direction changes, more or less of the light is able to pass through a polarizing layer on the face of the display. Change the voltage, and the amount of light is changed. 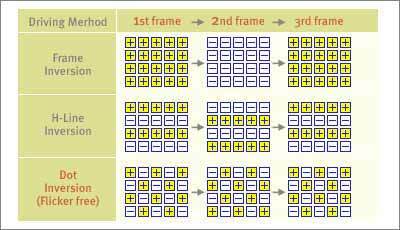 There are two ways to produce a liquid-crystal image with such cells: the segment driving method and the matrix driving method. The segment driving method displays characters and pictures with cells defined by patterned electrodes. The matrix driving method displays characters and pictures in sets of dots. Direct vs. multiplex driving of LCD TVs. The segment drive method is used for simple displays, such as those in calculators, while the dot-matrix drive method is used for high-resolution displays, such as those in portable computers and TFT monitors. Two types of drive method are used for matrix displays. In the static, or direct, drive method, each pixel is individually wired to a driver. This is a simple driving method, but, as the number of pixels is increased, the wiring becomes very complex. An alternative method is the multiplex drive method, in which the pixels are arranged and wired in a matrix format. To drive the pixels of a dot-matrix LCD, a voltage can be applied at the intersections of specific vertical signal electrodes and specific horizontal scanning electrodes. This method involves driving several pixels at the same time by time-division in a pulse drive. Therefore, it is also called a multiplex, or dynamic, drive method. There are two types of dot-matrix LCDs. Passive-matrix vs. active-matrix driving of LCD Monitors. In passive-matrix LCDs (PMLCDs) there are no switching devices, and each pixel is addressed for more than one frame time. The effective voltage applied to the LC must average the signal voltage pulses over several frame times, which results in a slow response time of greater than 150 msec and a reduction of the maximum contrast ratio. The addressing of a PMLCD also produces a kind of crosstalk that produces blurred images because non-selected pixels are driven through a secondary signal-voltage path. 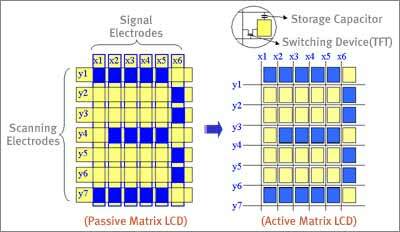 In active-matrix LCDs (AMLCDs), on the other hand, a switching device and a storage capacitor are integrated at the each cross point of the electrodes. The active addressing removes the multiplexing limitations by incorporating an active switching element. In contrast to passive-matrix LCDs, AMLCDs have no inherent limitation in the number of scan lines, and they present fewer cross-talk issues. There are many kinds of AMLCD. For their integrated switching devices most use transistors made of deposited thin films, which are therefore called thin-film transistors (TFTs). The most common semiconducting layer is made of amorphous silicon (a-Si). a-Si TFTs are amenable to large-area fabrication using glass substrates in a low-temperature (300°C to 400°C) process. An alternative TFT technology, polycrystalline silicon - or polysilicon or p-Si-is costly to produce and especially difficult to fabricate when manufacturing large-area displays. Nearly all TFT LCDs are made from a-Si because of the technology's economy and maturity, but the electron mobility of a p-Si TFT is one or two orders of magnitude greater than that of an a-Si TFT. This makes the p-Si TFT a good candidate for an TFT array containing integrated drivers, which is likely to be an attractive choice for small, high definition displays such as view finders and projection displays. 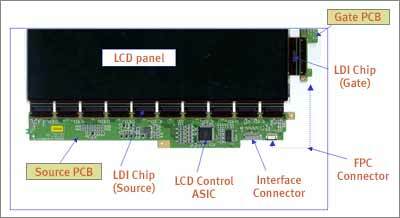 A TFT LCD module consists of a TFT panel, driving-circuit unit, backlight system, and assembly unit. It is commonly used to display characters and graphic images when connected a host system. The TFT LCD panel consists of a TFT-array substrate and a color-filter substrate. The vertical structure of a color TFT LCD panel. 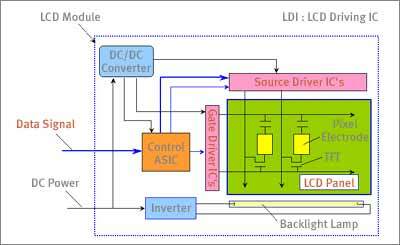 Driving an a-Si TFT LCD requires a driving circuit unit consisting of a set of LCD driving IC (LDI) chips and printed-circuit-boards (PCBs). The assembly of LCD driving circuits. A block diagram showing the driving of an LCD panel. 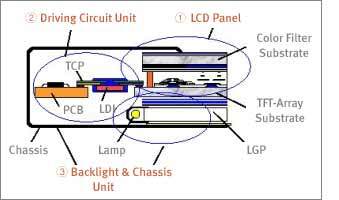 To reduce the footprint of the LCD module, the drive circuit unit can be placed on the backside of the LCD module by using bent Tape Carrier Packages (TCPs) and a tapered light-guide panel (LGP). A TFT LCD panel contains a specific number of unit pixels often called subpixels. 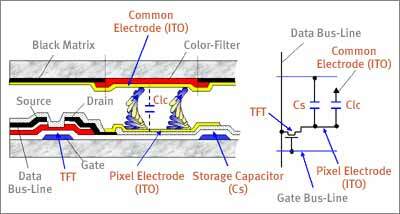 Each unit pixel has a TFT, a pixel electrode (IT0), and a storage capacitor (Cs). For example, an SVGA color TFT LCD panel has total of 800x3x600, or 1,440,000, unit pixels. Each unit pixel is connected to one of the gate bus-lines and one of the data bus-lines in a 3mxn matrix format. The matrix is 2400x600 for SVGA. Structure of a color TFT LCD panel. Because each unit pixel is connected through the matrix, each is individually addressable from the bonding pads at the ends of the rows and columns. The performance of the TFT LCD is related to the design parameters of the unit pixel, i.e., the channel width W and the channel length L of the TFT, the overlap between TFT electrodes, the sizes of the storage capacitor and pixel electrode, and the space between these elements. The design parameters associated with the black matrix, the bus-lines, and the routing of the bus lines also set very important performance limits on the LCD. In a TFT LCD's unit pixel, the liquid crystal layer on the ITO pixel electrode forms a capacitor whose counter electrode is the common electrode on the color-filter substrate. A storage capacitor (Cs) and liquid-crystal capacitor (CLC) are connected as a load on the TFT. Applying a positive pulse of about 20V peak-to-peak to a gate electrode through a gate bus-line turns the TFT on. Clc and Cs are charged and the voltage level on the pixel electrode rises to the signal voltage level (+8 V) applied to the data bus-line. The voltage on the pixel electrode is subjected to a level shift of DV resulting from a parasitic capacitance between the gate and drain electrodes when the gate voltage turns from the ON to OFF state. After the level shift, this charged state can be maintained as the gate voltage goes to -5 V, at which time the TFT turns off. The main function of the Cs is to maintain the voltage on the pixel electrode until the next signal voltage is applied. Liquid crystal must be driven with an alternating current to prevent any deterioration of image quality resulting from dc stress. 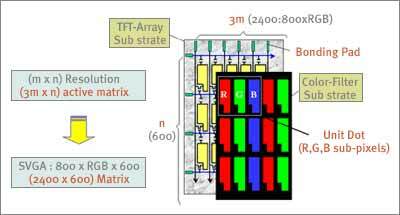 This is usually implemented with a frame-reversal drive method, in which the voltage applied to each pixel varies from frame to frame. If the LC voltage changes unevenly between frames, the result would be a 30-Hz flicker. (One frame period is normally 1/60 of a second.) Other drive methods are available that prevent this flicker problem. In an active-matrix panel, the gate and source electrodes are used on a shared basis, but each unit pixel is individually addressable by selecting the appropriate two contact pads at the ends of the rows and columns. By scanning the gate bus-lines sequentially, and by applying signal voltages to all source bus-lines in a specified sequence, we can address all pixels. One result of all this is that the addressing of an AMLCD is done line by line. Virtually all AMLCDs are designed to produce gray levels - intermediate brightness levels between the brightest white and the darkest black a unit pixel can generate. There can be either a discrete numbers of levels - such as 8, 16, 64, or 256 - or a continuous gradation of levels, depending on the LDI. The optical transmittance of a TN-mode LC changes continuously as a function of the applied voltage. 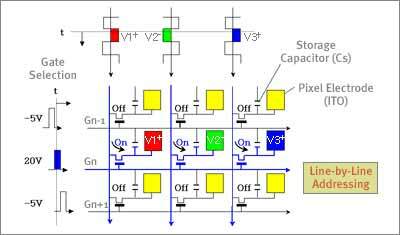 An analog LDI is capable of producing a continuous voltage signal so that a continuous range of gray levels can be displayed. The digital LDI produces discrete voltage amplitudes, which permits on a discrete numbers of shades to be displayed. The number of gray levels is determined by the number of data bits produced by the digital driver. 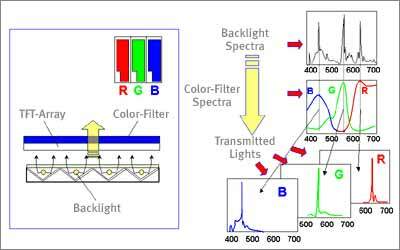 The color filter of a TFT LCD TV consists of three primary colors - red (R), green (G), and blue (B) - which are included on the color-filter substrate. How an LCD Panel produces colors. The elements of this color filter line up one-to-one with the unit pixels on the TFT-array substrate. Each pixel in a color LCD is subdivided into three subpixels, where one set of RGB subpixels is equal to one pixel. Because the subpixels are too small to distinguish independently, the RGB elements appear to the human eye as a mixture of the three colors. Any color, with some qualifications, can be produced by mixing these three primary colors. The total number of display colors using an n-bit LDI is given by 23n, because each subpixel can generate 2n different transmittance levels. We would like to express our appreciation to Samsung Electronics for the preceding information.